"Color It Off" is computer game in the making. It runs in a normal window and it is easy to install. This is developed by our youngest son, Gilbor Camporazo, Junior, a 2nd year programmer student of LaSalTech, La Carlota City. This is his first amateur attempt to make a computer game which could be played in every personal computer. He took him about three days to complete this kind of game. 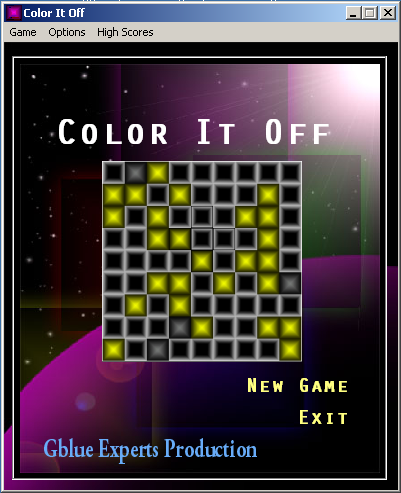 He named it as "Color It Off" - a one-player game for the trick is putting off those colored lighted tiles. He had made this as inspired by a puzzle game from a cellphone of his classmate by putting off the lights from the 25 tiles. 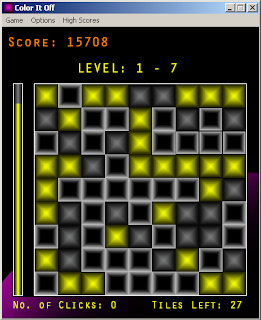 While his game is composed of 81 tiles with sound, with different colors as the level of difficulty increases. There are 5 levels and in every level, there are 10 sub levels. The visible lighted tiles gradually increase in number as the sub level increases too. In every level, there is a different color and music. The player should complete the level within the time limit for there is a timer to beat. As the level increases, the time ticks faster. There are menus to select like Game, Options, High Scores. It has a pause option when the game is currently played, then another menu is clicked. 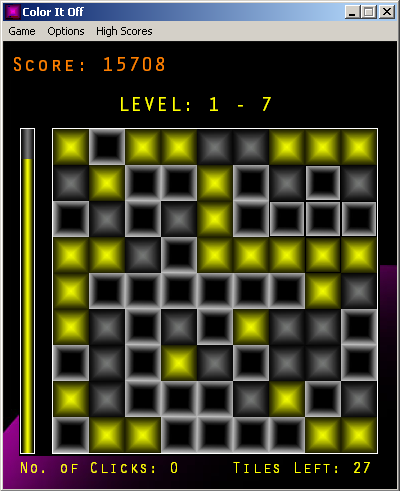 The game is played by clicking a tile or a blocked tile at the center of a group of 5 lighted color tiles, forming a cross. Then the lighted tiles go off. When all done, the player is led to the next level. He puts a little trick to make the game exciting and worth playing. In every level, there are blocked tiles. It's up for the player to guess and click those blocked tiles. When the game is over, an option button to continue or exit is displayed. He is again on the process of making another game similar to shoot-and-hit game with an option of clicking the mouse to change the color of the object used for bullet to hit a group of targets with the same color of that of the bullet. For the meantime, I'm only introducing it here. Sooner or later he will come up with a beta of this game for others to play. He has already prepared a free license to play. Again it is easy to install. This game is produced by GBlue Experts Corporation, his virtual entity. With this technology, a high technology for that matter, games in varied forms, styles which could be played in any computer and even in different types, model of cellphone are coming out in droves and unprecedented production. Wow, that's a neat puzzle game. Congrats to your son. I love playing puzzle games as it keeps the mind sharp. After he finishes his final touches, documentation of his new PC game. I will send you a beta version for that. Play it to test how good it is. Thanks for that. I'd love to play that PC Game. I once met a game developer before and they start like this and eventually make it bigger until it attracts the attention of the big time computer companies and buys it. I hope your son reaches this level in the future. Ang galing naman.My mother will surely like this.She is into games, pampatulog nya. Another way to make us proud is when Filipinos work hard and utilize their intelligence in a positive way. Great program! Wow! This is a very good start. Im also in the game development industry and I can a very good potential in our students. Once he finished his first game, im sure he's off to another game which will have the newest technology nowadays in game development such as HTML5, Unity3D or even Flash. Your son has a promising talent. Modern technology makes it easier for talented persons like him to put into actual practice every idea in mind and make an impressive invention like this game called Color It Off. More power to Gilbor! Congratulations to your son! This is a marvelous work and a very good start to hurdle the IT world. I couldn't imagine how the characters and IT terms work to have this game achieved. You must be very proud of your son and rightly so because not everyone can do what your son did. Wow! Something to be really proud of! Congratulations!! One day, soon, he'll be popular because of the creative programs he's programming! I am quite sure he can make it big in the future. Hope to see his name as one of the best Filipino programmer soon. Congrats sir Gil, you have a very smart son! Programming a game like this is not ordinary. And to Gilbor, you're awesome! Looking forward for more creations! Congrats! 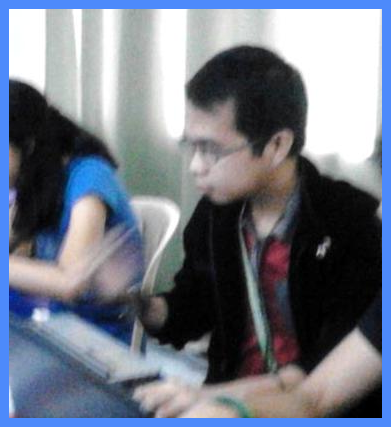 You're so blessed to have a son like him..:-) I hope it would be more successful after the beta version. Impressive! You have a very talented son. Congratulations!